22-Jun-2001 -- Coming from Low Tatras Mountains respectively from 49N 20E, we proceeded to the Pannonian Lowlands passing the beautiful mountains of the Low Tatras. With some problems we could find our way out of Nové Zámky/Érsekújvár to go 12 km further to the west, to Zemné/Szimö. Passing huge agricultural fields cultivated by kolkhozes we turned off to the right before the entrance of the village Zemné/Szimö in direction northwest. 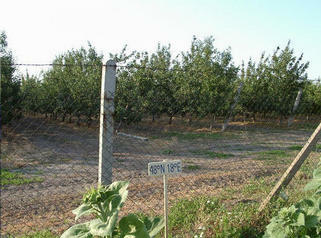 At the end of the dead-end road we stopped at a vast apple plantation. Unfortunately this area was surrounded by a fence und the gates were locked. We tried to ask a local farm worker, but in spite of language problems (this area of Slovakia has a mixed Slovakian-Hungarian population), he tried to offer us accommodation for the oncoming night. It was too late to return to the nearby kolkhoz and to ask for an entry permit. So we drove back slowly and realized that we may succeed by following the fence with the adjacent sunflower field. We walked for a few hundred meters to northeast and spotted the confluence just about 7 m behind the fence between apple trees. After a visit to the nearby graveyard with a majority of Hungarian names we went to the river Váh (pic #6). This river is the longest Slovakian river and yesterday at 49N 20E we were close to one of its springs, the Čierny Váh (Black Váh). The river ends at Komárno (a town with 50,000 inhabitants – pic #7) and flows into the river Danube. Finally we enjoyed a visit to a local beer garden and met nice people there (pic #5). We pray that this part of Europe will never be thrown into an ethnical war like Yugoslavia. Then we returned to Austria via Komárno and Bratislava and had to experience again some delay due to sluggish dispatching by the Slovakian border officials. See more pictures at http://www.fortunecity.de/arbeit/medien/748/Confluence/48N18EE.htm.